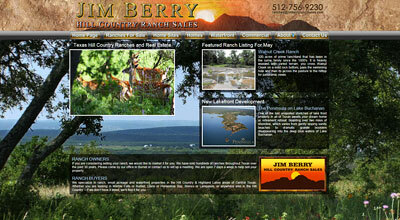 Jim Berry Hill Country Ranch Sales is based in Burnet, Texas. We have a small, tight knit group of sales associates, each with unique skills conducive to selling Hill Country ranches. Our market presence is second to none. Driving the country roads winding through the Hill Country, it’s hard to miss our distinct signs advertising beautiful ranches for sale throughout the area. Our office is conveniently located on Hwy. 281 in Burnet, just 45 minutes from downtown Austin, and our doors are open seven days a week. We spend liberally in the area of print advertising and target those advertising dollars to capture buyers that are seeking Hill Country properties. As owners of one of the first websites created in the ranch brokerage industry, we have a huge presence on the Internet. We go to great lengths to keep our website at the top of various Internet search engines and update it daily. 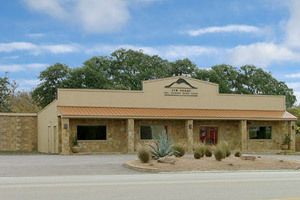 In addition to our own prominently featured website, we are premium members of some of the leading websites in the ranch brokerage and real estate industry, including www.landsoftexas.com and www.realtor.com. Ultimately, we have a keen appreciation for the value of marketing and are always looking for ways to improve and innovate. But selling ranch properties isn’t just about marketing. It also requires expertise in ranch real estate and a high level of knowledge about the land itself. Our associates’ backgrounds include game management, cattle ranching, land surveying and land planning. Our associates have certifications in ranch management and immense experience in ranch brokerage (over 75 years combined experience). Land in the Hill Country is diverse and we utilize our diverse qualifications and experiences to help buyers and sellers understand the market and appreciate the inherent value of each individual property. Most importantly, we get results. Since 2005, we have closed over 850 transactions totaling more than $350,000,000 in sales. See our Ranches Sold for more information.